The proposal, which sets out how the EU will meet its commitments under the Paris climate agreement, lays out eight emission reduction scenarios for 2050 and came out in favour of reaching net zero emissions, which would be closest to achieving the goals of the Paris agreement. A clean planet for all — this is the title of the EU Commission’s strategy for a climate-neutral economy by 2050. The proposal, which sets out how the EU will meet its commitments under the Paris climate agreement, lays out eight emission reduction scenarios for 2050 and came out in favour of reaching net zero emissions, which would be closest to achieving the goals of the Paris agreement. The most important element of the strategy is that it sets the goal of a carbon neutral Europe by mid-century. In its strategy, the EU Commission does not yet lay down any concrete steps. It sees its paper as a long-term vision for Europe to open a debate rather than to indicate a clear way forward. “More than 90% of European are concerned about climate change. We must take bold actions to limit global warming. 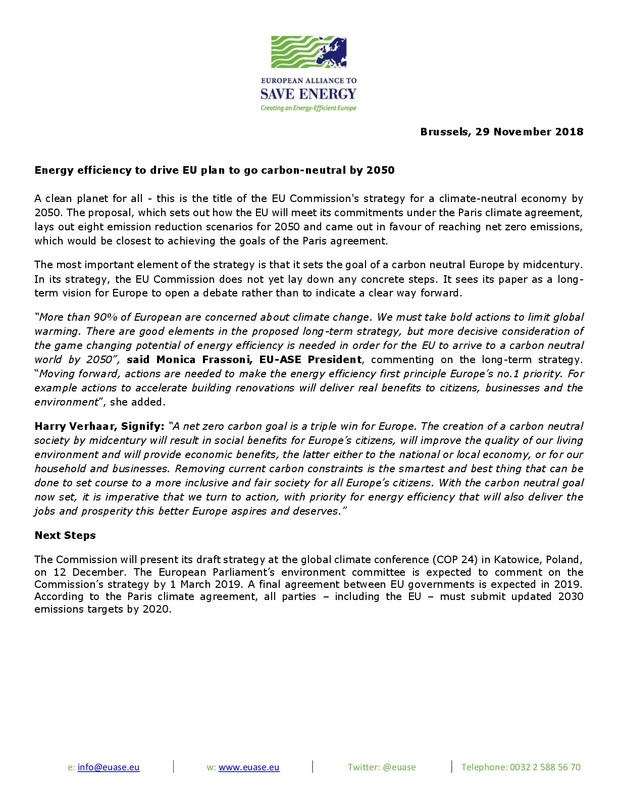 There are good elements in the proposed long-term strategy but more decisive consideration of the game changing potential of energy efficiency is needed in order for the EU to arrive to a carbon neutral world by 2050”, said Monica Frassoni, EU-ASE President, commenting on the long-term strategy. “Moving forward, actions are needed to make the energy efficiency first principle Europe’s no.1 priority. For example actions to accelerate building renovations will deliver real benefits to citizens, businesses and the environment”, she added. The Commission will present its draft strategy at the global climate conference (COP 24) in Katowice, Poland, on 12 December. The European Parliament’s environment committee is expected to comment on the Commission’s strategy by 1 March 2019. A final agreement between EU governments is expected in 2019. According to the Paris climate agreement, all parties – including the EU – must submit updated 2030 emissions targets by 2020.